There are many times throughout the Christmas holiday period where we all wish we’d just got on a plane and flew away somewhere. These electronic holiday cards for business depict that idea perfectly. With ‘Merry Christmas’ written in crisp white sand and a cloudy blue sky above teal blue water, there isn’t a soul that would say ‘no’ to visiting this place. 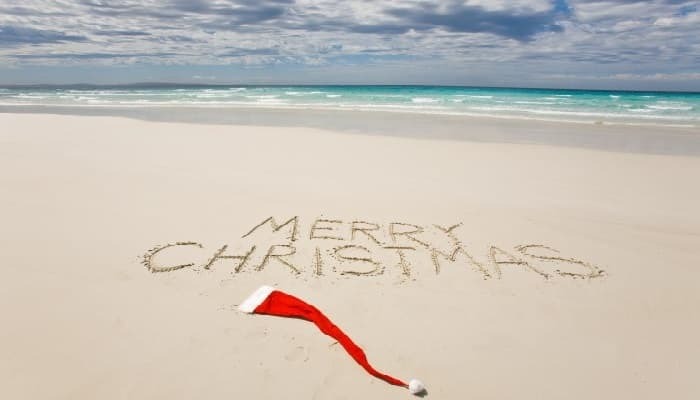 The red Santa hat draped across the sand is the final touch to a card that says, ’if only’. The idea of relaxing on a secluded beach with a drink in hand is one that very few get to experience but that doesn’t mean we can’t dream and with these ecards, the dream comes to life. Send it to a business associate that will know exactly what you mean as soon as they open it or use it to remind colleagues that a well-deserved break is coming up and you want them to enjoy it. They can be used as electronic Christmas cards for business and each person that receives one will have a smile on their face. To add an extra touch of laughter, create your own funny message and send it with the ecards.